We know that saving for a down payment can seem like a big task for a first time home buyer. Making a savings plan often requires taking an in-depth look at your budget and spending habits. 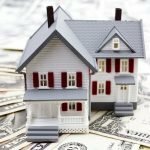 This list will help you with ideas to help you save in small ways that could add up to a solid down payment on you first home. You might be surprised at how much a daily cup of coffee is adding to your monthly spend. If you are buying a cup of joe on your way into work, it may be worth the extra effort to make your coffee at home, when you look at the cost comparison. Do you pay for a subscription that you don’t really need? When you are saving to buy a home, it’s a great idea to consider canceling these expenses. Build your credit wisely. It’s important to be aware of the actual cost of high interest credit cards. We all have change in our car or in a bowl on the dresser. Now is a good time to gather up those nickels and dimes and put them toward your goal. Although it is tempting to spend a hard earned bonus, adding this extra income to your savings could get you to your goal of home ownership much faster. Eating a fresh home cooked meal is not only usually more healthy, but it saves money. Eating leftovers can also make extra room in your budget. The mark-up on the price of a tea, soda, and especially alcoholic beverages in restaurants is extreme. If you do eat out, you can save a lot by ordering water. When you aren’t thinking about it, you can add up your savings by scheduling automatic transfers from your checking to your savings. The amount you transfer can be as large or as small as your budget allows. Reducing your utility bill is a great habit to have. Turn lights off when you aren’t in the room, unplug the small appliances you aren’t using, and let the sun dry your clothes on a nice day. Shorter showers, running the washing machine fewer times, and other water conservation techniques can reduce your water bill. Consider spending time at a public park, volunteering, participating in community events, or other engaging activities that are free of cost. If you have things that you simply don’t use anymore, selling those things has never been easier than it is now with our available technology. Just because you see something for sale, doesn’t always mean you should buy it. Focus on your goal of saving for a down payment and avoid buying things that you don’t need. Paper plates, plastic cups, paper towels, plastic cutlery and other one time use products may be convenient. Ultimately they hold no value and you will literally be throwing away money. Consider keeping your smart phone, tablet, or laptop, even if it isn’t the latest and greatest version. While you are saving for your down payment you should consider keeping your current technology around a bit longer. Granola and granola bars are quite expensive when you consider the ingredients and the serving sizes. Buying your own rolled oats, seeds, nuts, and dried fruits for your own custom recipe could save you quite a bit over time. The ingredients for a cake or batch of cookies are far less expensive than buying the finished product from a bakery. If the option is available for you, carpool or take public transportation to work. Choosing to drive a more fuel efficient vehicle can help you with your goal of saving for a down payment on your dream home. Eating out for lunch during the work week can add up quickly over time. Bringing healthy home made lunches may be one of the biggest contributors to your savings. The cleaning isle is full of options for cleaning every surface of your home with a different bottled solution. The truth is that you only need one natural all purpose solution to tidy clean most of your home. There are cards that sing, pop-up, and glitter their way into our celebrations, but end up in storage or eventually the trash can. A simple handwritten note will likely be more meaningful and it won’t cost you nearly as much. Birthdays and Holidays can be your budget’s worst enemy. Consider asking the adults in your family to draw names for exchanging gifts. You might also consider giving handmade gifts, or trading in the fancy wrapping paper for the funny pages. Change your filters and clean off the build up. If your appliances are running efficiently, then you are saving on energy costs. You can read more in this previous blog post about essential cleaning tasks in your home. One of the biggest ways to save on your energy bills is to set your thermostat with energy conservation in mind. Don’t make your system work hard when you aren’t home, set the temperature to a conservative setting while your away. Going to the movies can be an expensive night out. Put the money you would have spent on tickets and popcorn in your savings account and enjoy a movie from the comfort of your own sofa. Keeping less junk food in your pantry, may not only be a healthier choice. You can also save money by not spending your dollars on food that doesn’t give your body the nutrition it needs. Ditching the gym membership can add a good amount to your monthly savings. Saving for a down payment of a home takes motivation too. It’s pretty easy to find a tutorial online for making simple home repairs and maintenance solutions. Doing these projects yourself instead of paying someone else to do them is a big money saving strategy. Growing your own fresh vegetables and herbs can cut your grocery bill. 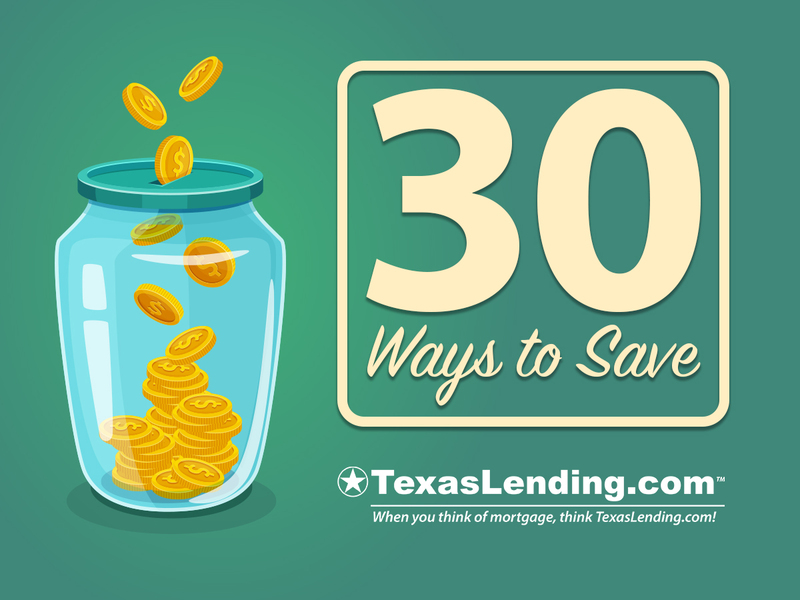 Helping you put more toward saving. Buying in bulk is a way to save long term on the things that you need. Buying a home is the biggest purchase most people will make in their lifetime. With planning saving for a down payment, can add up quickly. You can also find more information about the home buying process here, in one of our previous blog posts. Our licensed mortgage consultants are ready to answer your questions about home buying, anytime. 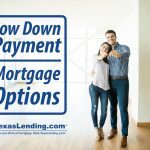 Start the conversation at TexasLending.com.